Supernatural: Running it into the Ground? Did you know, I used to be one of the biggest Supernatural fans? I wish I had kept a blog back when it first started, because my recaps would've likely been much more glowing than they are now. Alas, blogging was a mystery back in 2005. Oh wow, 2005. It somehow seems like ages ago and just yesterday at the same time. It was when I first moved to LA, first started graduate school, first tried out online dating. A lot of firsts back then. Have I really lived in LA that long? Egads! That's a topic for another day. 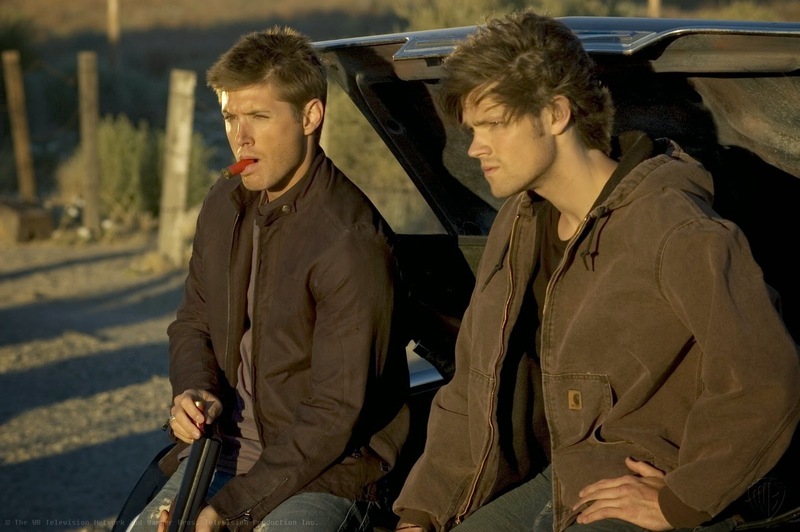 Supernatural's first season definitely was not its best, but it set up something that would become one of the longest-running shows on TV. It wasn't even certain the show would continue on after the first season, and now here we are, barreling down to the end of season nine and on into season ten. But I'm feeling fatigued. I've made a promise to myself that I will keep reviewing it until the bitter end, but right now that end does sadly look bitter. A show I once was so excited about I can now hardly garner much more than a shrug of indifference toward. That's not to say it's bad now, but is it really still good? The epic love story of Sam and Dean has tread the same waters over and again with their characters, because there's only so many places you can go. Death has become somewhat meaningless on the show now, whereas back when John died it was this huge thing. Now if someone dies, you can almost guarantee they're going to come back in some way, especially if they're a fan favorite, and almost certainly make us annoyed about it. Both Bobby and Kevin came back as ghosts. Yes, they're gone now, but the episode where Bobby originally died nearly lost all meaning after the numerous ones after where he was this sort of vengeful spirit. Back at the end of season five, I wasn't ready to say goodbye either. The show was running on all four cylinders. The end of season five was a natural ending point, but here we are, four years later, and I'm starting to think it really should've just ended back then, with the original ending Kripke intended, whatever that may have been (though we can speculate). Back when it was at the top of its game, rather than becoming a shadow of what it once was. The real test for me came when I started thinking about if I would actually change my top 10 episodes list I made back when season 5 ended. I'm really not sure I would. Maybe to add The French Mistake, but that's about it. Now it's your turn to speak. Do you think I'm totally off base? Do you think the show is still as good as it was, or even better? Or do you agree? You can vote in my poll, and/or head to the comments and discuss. I'm all ears! When should Supernatural end/have ended? It should go on forever! Psst! Hey you! You should totally go like my Facebook page. I'd love you forever and ever. Click and like: http://www.facebook.com/freshfromthe.com. I still enjoy the show...sometimes just to see fine acting. I'm actually glad season 9 has been about the guys finally hashing out their issues. Though I don't want it to end, I REALLY don't want it to end by staying too long. Season 10 should be the end. Time to wrap up a good story. Yeah I just hope they don't try to extend beyond season 10! I agree with everything you've said. Hell, I agree so much that it's depressing. I used to love this show; now I don't even watch the new episodes anymore. I don't even miss the show, not nearly as much as I miss being excited about it, and that's the heartbreaking part. I still read episode reviews like yours, and still immerse myself in good fanfic, and will probably stare at pretty pictures of these actors for many years to come, but that's about it. I'll always love and own the early seasons on DVD, but it's bad when only the first five seasons of a ten-year show are worth owning. I've read how Season Nine ended, and as much as I love Dean, I don't even feel like I missed anything, and feel no real pull to watch Season Ten.